From "Limited Collector's Edition" #C-31 (1974). Art by Curt Swan. DC of course didn’t forget about the name Mary, using it as the name of Martha’s Earth-2 counterpart once the multiverse came along. Her last pre-Crisis appearance was in 1981’s “New Adventures of Superboy” #15-16. In that story, Superboy accidentally winds up on Earth-2 in the 30s and meets Earth-2’s John, Mary, and Clark Kent. Between 1938 and 1986, Martha died sometime during the summer after Clark’s high school graduation. After John Byrne’s 1986 origin revamp of Superman, the Kents stayed alive into Clark’s adulthood. Thus, “post-Crisis” stories, i.e. stories published between 1986 and 2011, show Clark visiting the Kent family farm often for dinner. Post-Crisis, Ma Kent also has a more active role in raising super-powered youth. The Kents have taken in versions of the post-Crisis Supergirl, as well as the Kon-El Superboy. With 2011’s “New 52” origin revamp, both elder Kents are once more deceased in Clark’s adulthood. 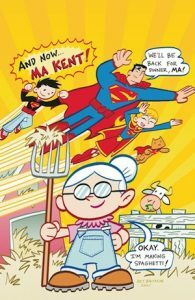 However, since they failed to fully bring back his Superboy career in Smallville, there’s now no real way to write stories about Ma and Pa Kent outside of sporadic flashbacks. This doesn’t seem one of DC’s more well thought out decisions, since the Kents still appear in other media. Ma and Pa Kent, as they appeared in 70s and 80s stories. Art by Kurt Schaffenberger. Still, Martha’s had a strong influence on her son’s upbringing. One prominent influence was that Martha, in most versions (other than the Golden Age and New 52) created Clark’s costume. In the Silver and Bronze Age comics, Martha (along with Jonathan) also ran the Kents’ general store in Smallville. Modern portrayals show Martha’s interested in modern life aspects, including computers and the Internet. An example of this is seen in the 2000s “Birthright” miniseries, where she regularly emails Clark. Another example is in “Lois and Clark,” where Martha points out to Lois the Kents’ (then-cutting edge) fax machine. Finally, Martha’s maiden name is “Clark,” which they used for little Kal-El’s first name after adopting him. Besides DC’s Schrödinger-esque treatment of her living status, Martha’s age has also varied through the years. Traditionally, the Kents are supposed to be elderly. However, DC (and media spin-offs like “Smallville”) often portray them as middle-aged instead. This is probably to make them seem “hipper” or for marketing demands. The first de-aging came in the late Silver Age. A late 60s story saw the Kents de-aged due to an alien serum. However, subsequent flashbacks to before this incident often forgot about this and just drew them as middle-aged anyway. 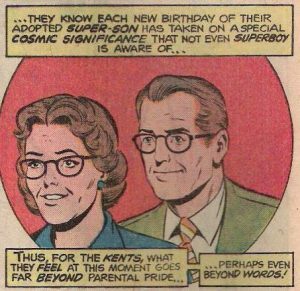 Post-1986 flashbacks to Superman’s youth often show the Kents as middle-aged, while being elderly in the present day. June 18: Kal-El’s landing on Earth. Celebrated as Clark Kent’s birthday; Superman’s birthday, of course, is February 29, Leap Day. June 25: Clark is formally adopted from the Smallville Orphanage. Modern stories vary on how he was adopted, due to changes in child services in recent decades. For myself, I prefer the old-school take on this (or something similar), out of nostalgia/feeling more straightforward than some recent versions. Though “the authorities, unable to find Clark’s real parents, allowed local upstanding citizens the Kents to adopt little Clark” could still work today. July 8: Pre-Crisis, Ma and Pa Kent are made younger via the aforementioned alien serum. August 9: Ma and Pa Kent’s death, in pre-Crisis stories. Presumably the same date may apply to the New 52 versions. October 21: Ma and Pa Kent’s wedding anniversary. November 7: Martha’s birthday. Jonathan’s birthday, by the way, is September 1.